A compromise proposed in a meeting of the Mississippi Public Service Commission would allow the PSC to punt on a move to approve spending on the most controversial component of the Kemper Project. Southern District commissioner Steve Renfroe suggested Tuesday the PSC could split prudency hearings on the Kemper Project’s combined cycle plant, which contains electricity-generating turbines that have run on natural gas since August. GASIFIER: Kemper’s gasifier unit is designed to convert lignite coal into synthesis gas, which can be burned in the facility’s turbines to generate electricity. prudency compromise could allow the commission to give Mississippi Power some financial relief. The PSC could also pass to the next commission in 2016 the tougher question of judging whether the costs incurred on Kemper’s gasifier — which turns lignite coal into a natural gas-like substance called synthesis gas to be burned in its electricity-generating turbines — are the responsibility of Mississippi Power or its customers through rate increases. According to Mississippi Power, the gasifier is supposed to be operational by the first quarter of 2016. “I would encourage you to give this commission another option,” said Renfroe, appointed by Gov. Phil Bryant to finish the term of former commissioner Leonard Bentz. “The particular one I had in mind would consider the equipment that’s already in operation. The combined cycle has been in operation for quite a while, and recovering those costs would be more straight forward in my view. The PSC rescinded Tuesday a previous rate increase of 18 percent to comply with a Mississippi Supreme Court decision. The commission ordered the utility to respond with 14 days with a plan to refund present and past customers affected by the 18 percent rate increase approved by the commission in March 2013 to help pay for the Kemper Project. That increase could add up to between $335 million and $350 million in costs to the utility. The PSC, after it receives the plan, will hold a seven-day comment period before deciding on a final rule plan at the commission’s Aug. 6 meeting. According to Northern District commissioner Brandon Presley, the hope is to have the checks or credits to Mississippi Power customers by Nov. 1. He invited the utility to give the PSC more rate options. The rate reduction is the result of an order from the Mississippi Supreme Court in alawsuit brought by Hattiesburg businessman Thomas Blanton. In a motion to dismiss the utility’s proposed increase filed with the PSC, Blanton says any rate increase to help fund Kemper is illegal for several reasons. One of those issues is with two carbon dioxide contracts, which specify that two oil exploration firms — Denbury Onshore and Treetop Services LLC — would pay for carbon dioxide taken from the gas stream to use in oil fields. The contracts stated that if the two companies hadn’t received any carbon dioxide from the Kemper Project by May 11, they could exit without penalty. Denbury has cut its carbon dioxide purchases, as the price of oil hasn’t returned to recent highs of $125 per barrel. There’s also the matter of the South Mississippi Electric Power Association, which backed out of buying a share in the Kemper Project, which necessitated the recent return of a $337 million deposit paid to Mississippi Power. Blanton, who’s running for the Southern District seat on the PSC, said in the filing these unresolved issues go against the prudency standard in state law of “used and useful” when it comes to spending on the gasifier — one contract (SMEPA) has already been terminated and two other contracts (the carbon dioxide ones) could face a similar fate. In June, the court denied Mississippi Power’s request for a rehearing, which might have overturned the original order. 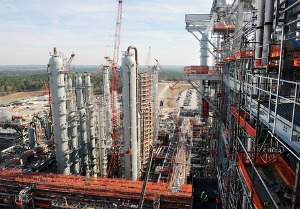 The now-$6.229-billion plant is billions over budget, two years behind schedule and has sparked a series of lawsuits.